Home Plate Umpire Tom Hallion's out call was overturned via Rule 7.13 in Philadelphia Thursday evening, giving Cincinnati the go-ahead run in the top of the 5th inning after a bases-loaded ground ball to short turned into a bang-bang tag play at home. 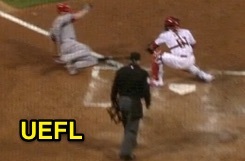 With one out and three on, Reds batter Todd Frazier hit a 0-2 curveball from Phillies pitcher Aaron Harang on the ground to shortstop Freddy Galvis, who threw to catcher Carlos Ruiz as Reds baserunner Anthony DeSclafani attempted to score, ruled an out by PU Hallion. Upon Replay Review as the result of a challenge by Reds Manager Bryan Price, Hallion's out call was overturned and Cincinnati awarded a run on the interference error by Ruiz. According to home plate collision Rule 7.13(2) [2015 OBR Rule 6.01(i)(2)], "Unless the catcher is in possession of the ball, the catcher cannot block the pathway of the runner as he is attempting to score. If, in the judgment of the umpire, the catcher without possession of the ball blocks the pathway of the runner, the umpire shall call or signal the runner safe. Not withstanding the above, it shall not be considered a violation of this Rule 6.01(i)(2) (Rule 7.13(2)) if the catcher blocks the pathway of the runner in a legitimate attempt to field the throw (e.g., in reaction to the direction, trajectory or the hop of the incoming throw, or in reaction to a throw that originates from a pitcher or drawn-in infielder). In addition, a catcher without possession of the ball shall not be adjudged to violate this Rule 6.01(i)(2) (Rule 7.13(2)) if the runner could have avoided the collision with the catcher (or other player covering home plate) by sliding." Amended for the 2015 season, the final line of Rule 7.13(2) [6.01(i)(2)] states, "This Rule 6.01(i)(2) (Rule 7.13(2)) shall not apply to force plays at home plate." MLB opted to remove Rule 7.13(2) from applying to force plays at home after Mike DiMuro's out call on June 18, 2014 was overturned when then-Pirates catcher Russell Martin stood on home plate to field a throw with the bases loaded and a force at home. At the time, MLB wrote the decision to lift the Rule 7.13(2) restriction from force plays at home would only apply to such obstructive force plays where the catcher requires access to home plate to complete the force out tag of home plate. Replays indicate Ruiz did not tag home plate and instead tagged the baserunner, which, by strict interpretation of MLB's rule change in 2014, may cause the provision removing Rule 7.13(2)'s applicability to such a play to be itself inapplicable, subjecting Ruiz to being called for blocking access to home plate in violation of Rule 7.13(2). Had Ruiz's foot instead been positioned atop home plate for the purposes of tagging the actual rubber slab (as in the DiMuro/Martin play), the Replay Review outcome likely would have been different.